Dream it. Believe it. Do it. Think like a Pro: Why Plot? Should I or shouldn’t I? Plot, I mean. Here’s the question every writer struggles with. Should I plot this sucker? Or should I follow where the idea leads me? Should I just launch into writing and see where it takes me? Or should I plot out every scene and sequel, checking all the boxes? A Continuation of the Previous Blog — which was shorter 😉 . The title of this chapter in Think like a Pro is “One Guiding Decision :: Plot It”, and plot is truly the guiding decision for any writing. While many plot structures abound (and several are discussed later in the Think/Pro chapter), it is the 7 Plot Types that will give the KEY that every writer needs to use to unlock story. That KEY is coming, I promise, but first let’s look at the three required elements for each of the 7 Plot Types. The scariest woman in all literature. 5 Stages of the Hero . . . and the Monster. Jurassic Park, in all its iterations. What do the items in this oddly-matched list have in common? These stories all have origins with the ancient Greeks and Romans. Sitting around fires after a day of hunting and gathering, the first writers developed techniques to influence their audiences. Those techniques have thousands of years of use and still hold true for capturing audiences. The ancient Greeks (and Romans) of classical antiquity viewed the stories and dramas that were enduring. And just like writers today, they searched and defined and classified the best techniques to create writings that pleased their audiences. These old geeky Greeks laid the foundations. Many of their techniques are still in use. Ideas original to them are re-packaged as glittery infographics and Wham-Pow webinars and three-point seminars with exclusive insights to Buy Now! Old Geeky Greeks: Write Stories with Ancient Techinques presents such ideas as the Blood Tragedy and dulce etutile in a clear, organized method for writers who want to write rather than invest hours getting three snippets of information. Chapters in OGG cover understanding characters to the five stages that established the modern protagonist from the ancient hero. Aristotle’s requirements for plot precede a survey of the oldest plot formula, the Blood (or Revenge) Tragedy. Concepts such as in medias res and dulce et utile can help writers solve sticky problems and develop new ideas. Old Geeky Greeks (and Romans) looked at successful plays and other story-telling methods to determine what influenced the audience. Which characters were still talked about weeks and months after a performance? Which play structures failed—and which were consistently winners? And which ideas helped writers develop their celebrated writings? Writers today are still searching for the answers to these questions. The bright minds of Classical Antiquity first explored these questions. Their answers are applicable even in the age of the internet, open-source software, special effects, and infographics. Aristotle, Seneca, Plato, Horace, and many other ancient geeks have their ideas matched to Harry Potter, Avatar, Last of the Mohicans, and Shakespeare. Whether we’re writing novels or plays, blogs or non-fiction, poems and songs, Old Geeky Greeks (written by M.A. Lee and Emily R. Dunn) is a seminar in 28,000 words, just published on Amazon Kindle. with Medusa’s head, provides the cover art for OGG. Join Writers’ Ink in 2017 as we explore characters and plot through archetype. There are only two or three human stories, and they go on repeating themselves as fiercely as if they had never happened before. What is an Archetype? It’s a chief type ~ a pattern or mold or model. These are patterns, elements for the artist to use or ingredients for the cook. The glory of the archetype :: it’s the basic form we can use when we start structuring our stories. Why should we use Archetype? When we understand the pattern—the archetype—then we can manipulate it—add/subtract, multiply/divide. We are not going to write stereotypes. Archetypes are the basic foundation—a basic technique to build a landscape or portrait or a basic recipe to center a dinner. A writer is like an artist. All artists learn basic drawing techniques: cross-hatching, smudging, scrumbling, stippling >> symmetry, depth perception, negative space. Just because an artist knows and understands the techniques does not mean her drawings will always look the same. Or consider the cook who actually wants to reproduce similar results with a recipe except as they tweak the flavors. In building a meal, however, certain dishes reproduce their recipes. Other dishes will showcase the cook’s ingenuity. The guests, the drinks, the place settings, the table decorations, and the atmosphere—all of these mix together in different ways to create a unique dining experience. Writers build story frameworks with these patterns. They then add concepts and personal techniques and skills. The broad strokes of archetypes may seem simplistic, but apple pie with a lattice top is still a great dessert. 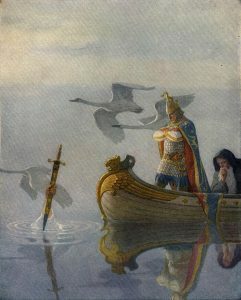 Is King Arthur the Ruler or the Warrior archetype? Is Merlin the Magician or the Sage? Events: birth, separation from parents, marriage . . . . Figures: sage, rebel, ruler . . . . Motifs: creation, deluge, apocalypse . . . .
Jung gives us the 12 Character Archetypes. We will examine these 12 Character Archetypes before we launch into story structure. After all, it’s the people who drive our stories, and it’s the people who engage our audience and bring them back. Next Blog on Jan. 15, discussing background: the 4 Who’s Who in the Development of Archetypes. Very dry. All text on this website is copyrighted as of the date of first publishing (the date of the blog, for example, or the date associated with the website. As a former teacher helping students find the correct information, however, I understand the problems of Works Cited sources. Here is the MLA form you may use when cited information on this website. Remember to use a hanging indent (which this widget doesn't allow). Writer. "Name of the Page." Name of the Website (underlined or italicized). Posting Date. Blog. Your Access Date. URL. You're welcome! Google may use certain Blogger and Google cookies, including the use of Google Analytics and AdSense cookies, and other data collected by Google. This is part of Google’s operation as a search engine which may lead you to this site or if you go elsewhere from this site. I imagine this will also occur with any other browser or search engine on the internet.